Sometimes I feel like I get so caught up in adding so many spices/flavors to everything that I miss out on what the individual ingredients taste like. (Especially things like curry powder, cumin, turmeric, cayenne, etc.) Because of that, I wanted to do an experiment and try a breakfast scramble / breakfast wrap where the rice is flavored with nothing but spice oil—which is already quite complex, actually. So I did. This is rice fried in spice oil + scrambled egg fried in spice oil + a little green onion. And a little salt. The verdict? It was good but there wasn’t enough… substance… to it, and I couldn’t tell if that was due to the simple flavoring or the coincidental lack of vegetables. I guess I’ll have to keep experimenting! Today’s post is an example of one of many possibilities for fried-rice-for-breakfast-that-makes-use-of-(salad)-leftovers. It contains—in addition to the base of white rice, a scrambled egg in bits, and spices/flavorings (spice oil, curry powder, chili powder, salt)—sauteed radish, sauteed mushroom, and a tiny amount of sauteed onions, plus some chopped up green onion thrown in right toward the end. Cooked on 2/21/2015. What I’m saying is that, for breakfast, if you have eggs and/or rice, and/or veggies, and are willing to be flexible, you can pretty much always come up with something tasty. It’s nearly impossible to fail on this completely, and it’s a great way to use leftovers. This one was especially good! Falafel is so good, and anyone can make it, as long as you can get your hands on a box of falafel mix. We usually buy Telma brand (it’s just what’s available, and a little pricey at grocery stores but some CVS stores carry it and it’s cheaper, like $3.50). You will also need to make tzatziki sauce. My (approximate) recipe and tips are below! Did you run out of chips before you ran out of pico de gallo? Fry up a thin, simple omelette (just scrambled egg, or scrambled egg and a little milk, however you like it), toast a piece of bread, and prepare yourself an open-faced pico & egg breakfast sandwich. As far as I know, this is an invention of yours truly. One could argue, though, that it’s just a deconstructed omelette. 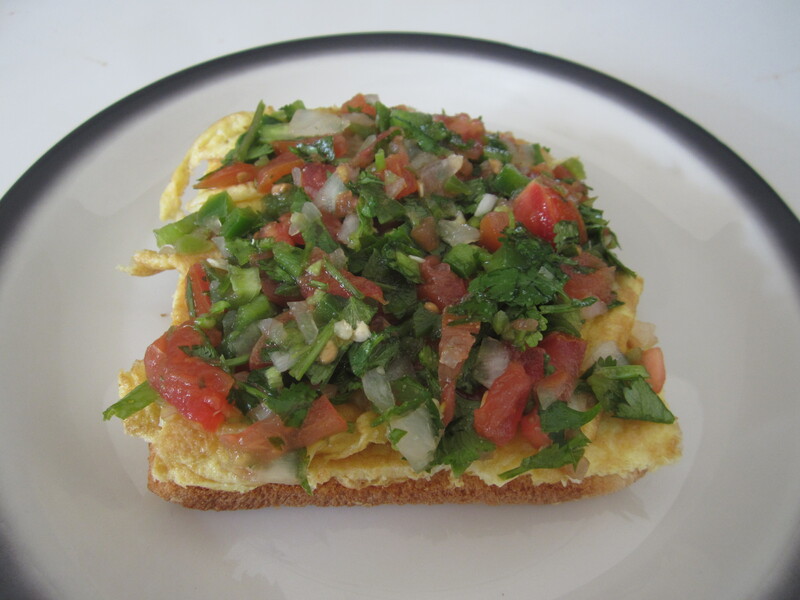 On that note, I bet frying the pico de gallo into the omelette would be very tasty too. Photographed in January 2014. Fajitas! This marks the only time since, like, 2006 that I bought beef that wasn’t ground. Well worth it! Unfortunately, since this was in 2011, I don’t recall the recipe. 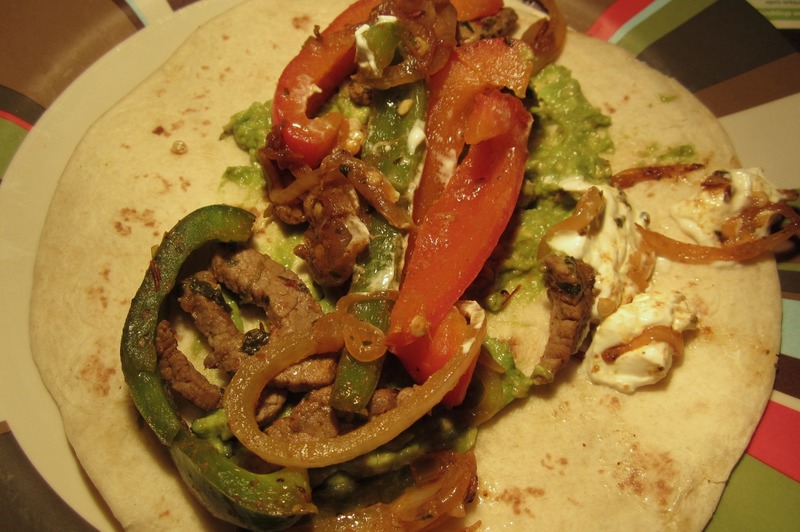 As you can see from the photo though, it was pretty typical: onion, bell pepper, beef, plus sour cream and guacamole. 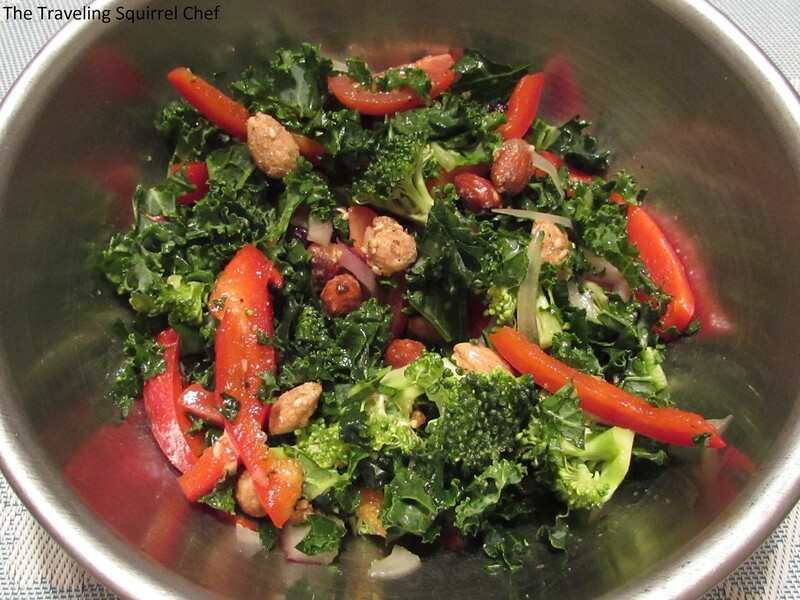 Now, on to your regularly scheduled food post: This tasty salad was made (Nov. 2014) with what we had on hand that night: Spinach, avocado, walnuts, blue cheese, tomato, mushroom, carrot, paper-thin red onion + balsamic vinaigrette, sea salt & black pepper. 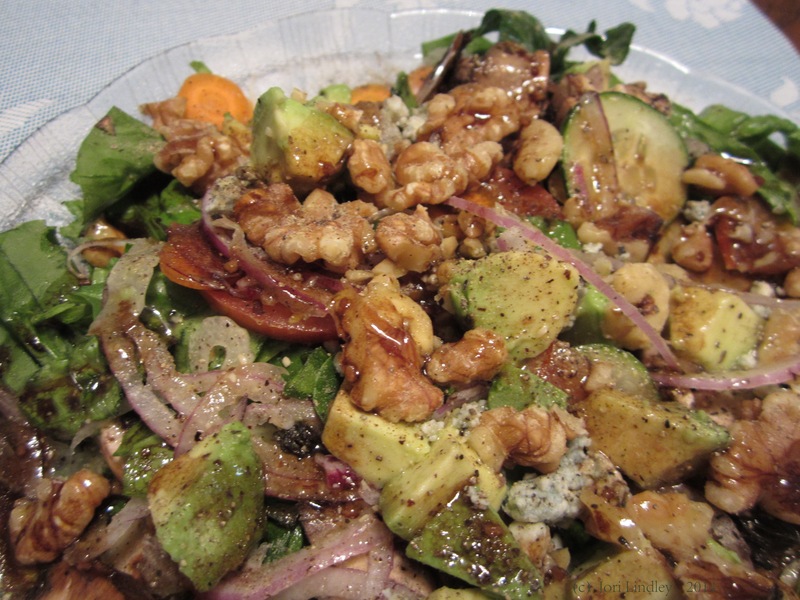 Disclaimer: I can’t take *too* much credit for how tasty this was… We already knew, from another recipe that we did not invent, that spinach, blue cheese, and walnuts go together quite awesomely, and we also already knew that avocado makes everything even better!